I made this groom's cake for a friend of ours wedding and it's one of my favorite creations! 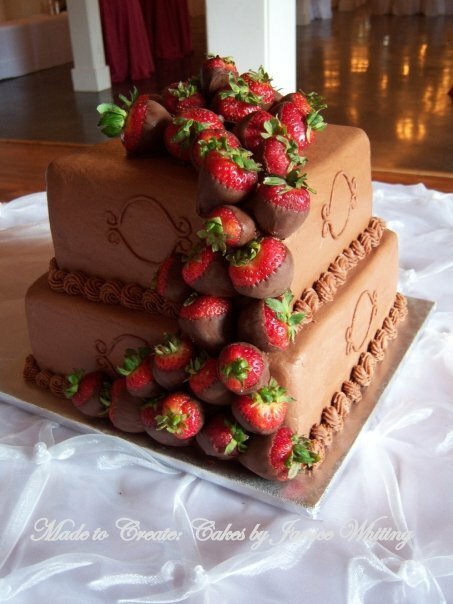 Of course, the best thing about it are those draping strawberries! I had never made a cascade of strawberries on a cake before and was overjoyed when I discovered that toothpicks worked marvelously in getting those strawberries to stay put! Wow, this is so clever and beautiful, Janice. And that cake looks so tasty. yay Janice!! what a great idea! perfect size for that stamp! She totally has a "how long are you gonna make me hold this look!" LOL! The card is great, the cake is very tasty. Wonderful creations! Such yummy ideas, and that cake...WOW very professional! Thank you for stopping by the party! Hope to see you again! Awesome! As are all your creations :). This is so creative Janice! Perfect dp and your design ROCKS!!! Love the cake too, you are so talented!! oh my goodness! this is so fun (the cake paired with Asela's retro wife) your real cake is DELICIOUS looking, so professional! you've done a fabulous job as Melanie's guest designer! This card is yummy--love how you added a choc. cake with strawberries... JUST LIKE the real deal!! How cool. I used to make party cakes... never got to the wedding styles, but it was fun until I got carpul tunnel syndrome real bad. ANYWAY... you are so talented--in cake decorating AND card making. I'm gonna peruse around your blog more. Have a great day!